Companies everywhere are asking how they can grow their organization (add people) without increasing their space. Sometimes the reason is minimizing carbon footprint. More often, it's about saving money and mitigating risk. But what does this entail exactly? Doing more with less. That means less space per person. It means making sacrifies and prioritizing what's really important. First to go are things like file or conference rooms, then comes the common strategy of packing people in like sardines aka "dense pack." Finally, the alternative work options are investigated. Can we get away with accommodating only 60% of our staff at any one time? What about telework or work at home policies? Looking at how we really work. In all of the workplace surveys I've done, 100% of the time, people assume they are in the office significantly more than they acutally are. Where are they? They're working alright, but on the move! They're checking email at home, blackberrying while walking the dog, making calls on the road, you name it. Our offices have lovely pictures of our children, but they are vacant a good portion of the time, which is why companies are frustrated with building and managing empty buildings. Trying new things. So you're trying to save space, but this means giving up your office and a permanent address!! Not an easy change - after all, we're creatures of habit and work is our home away from home. But perhaps it's time to think about "the office" as just another place to work. Some companies are designing their offices as large scale living rooms - you plop at a desk or comfy chair - whatever makes you and your team more productive. Managing to different goals. One of my first bosses out of graduate school had a mantra he still professes today... "must be present to win." He believes very strongly that he must see all of his employees to know they are working, and showing up everyday ensures advancement in his organization. But companies that think differently about what they are managing (not bodies, but products or projects) are able to make the leap to alternative work, and to better utilized workplaces that focus on what is needed to get the job done. Of course training and mentorship comes in to play, but is it needed in the same place and every day? Embracing green thinking. 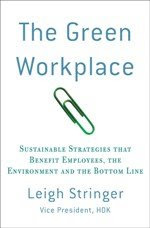 What's great about all of this recent investment in alternative work is that it goes hand in hand with green thinking. Often companies that build space for less people (adopting alternative work) are also considering the green benefits of less travel to the office (reduced carbon emissions) and the need to have productive space while you're there (natural light access, good air quality). This reminds me of one of the strategies adopted in the EPA building in Sacramento. Have the janitorial staff come in during the daytime - eliminating the need for lights to be on later into the evening - Plus - and this is a big plus, the office staff get to know the janitorial staff - get to know who is cleaning up their mess, perhaps making for a more wholesome and green workplace.